Do you want to successfully wholesale your handmade goods? 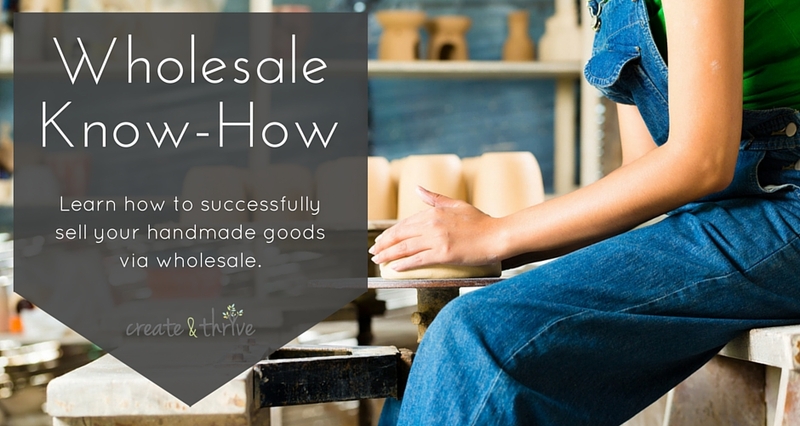 In this 30-day course, we’ll teach you everything you need to know to get the wholesale side of your handmade business up and running! I just wanted to take a minute to thank you for our calls and for hosting the Wholesale Know-How Course. I started the course with one idea of how I would approach wholesale, but through your teachings and our coaching sessions, I realised I had to scrap this pre-conceived idea, go back to the drawing board and create a new path moving forward. Who knows if I would have come to this point without doing the wholesale course. I don't think so, the course and the coaching have helped to shift me onto a path that feels simultaneously exciting and scary, so I take that to mean its the right path for me! So thank you as always for your excellent, insightful and timely teachings. Do you want to equip yourself with all the knowledge you need to get started, so you can stop second-guessing if you’re ‘doing it right’? Do you want to learn from someone who has DONE what they’re teaching you – who currently has a successful wholesale-based handmade business? Have you held yourself back from wholesale because it seems like a mystery? Wholesale Know-How is the course you’ve been searching for. What systems you need to put in place from the beginning to get things running smoothly: things like collecting, making, packing, and shipping orders? Exactly how other people have made wholesale the main part of their business? Wholesale Know-How will answer all these questions, and more. This is a systematic, step-by-step course that leads you through everything you need to learn in order to confidently step into the world of wholesaling. Not only that – this is a live course. We’re not throwing the content at you and telling you to go it alone – you’re going to be taking the course with an enthusiastic, driven group of fellow makers who are all determined to make a wholesale business happen. You’ll also get direct daily access to your teachers – me and Mel – throughout the duration of the course. We’ll be there to answer questions, give advice, and help to guide you in the right direction. Gold Members will get even more help – with group coaching calls, additional lessons; and Platinum Members will get 1/2 an hour one-one-one with me, as well as a critique of your catalogue by Mel! That’s an enormous amount of value for the incredibly affordable investment you’ll be making in this course. If you’ve ever held back from wholesaling because you weren’t sure if you were ‘doing it right’ – or because you fear you’re not ready, then this course will help you to eliminate those fears by giving you the knowledge and tools you need to make it happen. Today I have FINALLY finished my wholesale catalogue. Last year I completed the Wholesale Knowhow course with Jess and Melanie. Had I not done the course, I'm sure I wouldn't have got this far by today. The course stepped me through everything I needed to know to prepare for and sell wholesale - including the scary bits like writing my wholesale terms and conditions! Thank you ladies! Goal-setting – work out what your wholesale aims are. Getting all the legalities sorted from the get-go. Finding supplies at wholesale and trade prices. Business branding, and why it’s important. Why you need a website, and what you need to have on it. What’s the difference between consignment and wholesale? Which one will suit your business better? Pitfalls to avoid if you choose to do consignment. Pros and cons of selling wholesale. What do you need to include in your catalogue – what do retailers expect? Exactly which terms and conditions you need to think about and include. Photography tips for excellent catalogue photos. How to actually put a catalogue together. Who are your ideal customers, and where do they shop? Discover the right ways (and the wrong ways!) to approach potential stockists. The best ways to keep in touch with your stockists. How to take care of your stockists and maintain a profitable business relationship with them. The packaging you need to include with your wholesale orders, and what it says about your business. Learn how to price your products right for wholesale to ensure you’re making a profit. How to set a realistic hourly wage for yourself. All the overheads you need to consider in your pricing. How to set up an invoice template. The formula Mel uses to calculate her prices. A straight-forward system for taking and processing your wholesale orders. How to juggle wholesale and retail business. How to go about getting help with your business – outsourcing and hiring staff. How to track your expenses and evaluate the growth of your business. Planning for the future growth of your biz, and how to market your biz to reach more stockists. BONUS: There is also a Trade Fair add-on module available! If you’re been part of the Create & Thrive community for a while, you’ll know that my jewellery business – Epheriell – is almost exclusively online – I sell direct to my customers. But I saw so many of you asking about wholesale – wanting to learn exactly how to do it successfully. So, I enlisted the help of my good friend Melanie Augustin to teach this course with me! Like many of you, I started out small. I began making little creations from vintage kimono fabric finds in the second bedroom of my small Japanese apartment, after working a full-time teaching job though the day. I sold these through Etsy and even did a couple of craft markets in Japan. I returned to Australia while pregnant with my little girl and found great relief to know that I was able to earn money through my creations soon after we arrived as my belly grew to scary proportions and my husband hunted for a more conventional income. I picked up my first few stores after my daughter was born, but a couple of months later my husband became seriously ill and I suddenly needed to become the sole income earner for my little family. I needed income, but also needed to be at home looking after a three month old baby and seeing him through (successful!) treatment. To really kick-start my business, I jumped in feet first to doing my first trade fair and my little business swiftly grew, and has continued to do so ever since. I’ve learnt a lot a long the way, both through personal experience and through lots of studying and advice from others who have been doing it for longer than myself. I wish that there had been a course like this before I began, there certainly would have been less mistakes and angst! So, now, I hope to guide you in your wholesale adventures! How much time will each lesson take to complete? Make no mistake, this IS a time-intensive course. You get one lesson delivered each day via email. Some of the lessons might take you a scant few minutes – some may take you an hour or two… and some might be so life-and-business changing that you have to go back to the beginning and start all over again. There are some catch-up days in there, though, where you can either catch up on a lesson you’ve missed, or just take a break. If you’re concerned about how much time you have to complete each lesson, remember this:you have LIFETIME access to the course content (you even get it delivered in a handy-dandy ebook at the end of the course) and also LIFETIME access to the private Wholesale Know-How Facebook group. So the REAL question is – can you afford to spend months (or years) figuring it out on your own without direction? Or do you want to leap over the learning curve and cut down that time to just 30 days? Do I have to be in Australia to take the course? Nope! We’ve had folks from all over the world take the class. The content is just as relevant for someone living in Auckland as it is for someone living in New York, or London, or Johannesburg! Do I have to complete the whole course in the 30 days? Do I get access to the course info and FB group after the course ends? Absolutely! I don’t believe in ‘taking away’ the course content from you. You will have access to it forever – both in the emails you received, and in the form of an ebook, of the entire course at the end. And you also get lifetime membership to the course FB group, so you can pop in their and ask your classmates questions at any time (but I’m only active in there while a course is running). Can I take the course again in future if I pay for it now? Absolutely! Once you’ve signed up to the course, you can ‘retake’ it as many times as you like. The only caveat here is that if you are a Gold or Platinum member, you don’t get to participate in calls in future classes, or get your skype session/critique done again – those are once-offs. But you can always refer back to your ebook of the course and work through the course again with future cohorts of students in the FB group – in fact, I encourage it! What’s the course cost in my currency? Head on over to xe.com and enter the course price in AUD – then click the button to convert it to your currency. If you are in the US, Europe, or the UK, you’re getting a good deal, because your currency is worth way more than the AUD – the course will be much cheaper for you!